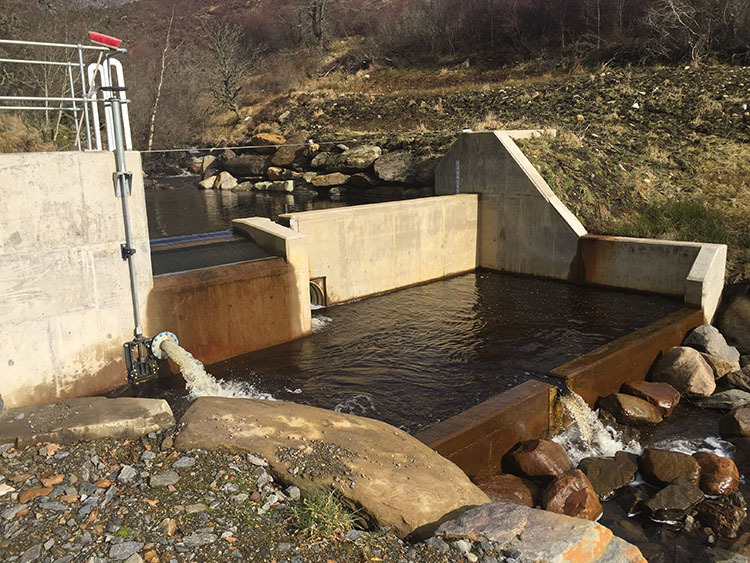 2017 sees the successful electricity production of the Beinn Eagagach Hydro Scheme continue into its second year. This hydro scheme is a joint initiative between Edradynate Estate and its neighbour, Derculich and is named after the summit of the catchment area. The interest in Renewable Energy has existed for some time now and Scotland has many rural areas with untapped natural resources such as water, solar and wind power. Construction of a Hydro Scheme in this location was considered the most environmentally friendly and visually attractive method of harnessing one of nature’s natural resources to help meet man’s increasing demand for electricity. Interestingly, both estates had early forms of hydro power which were constructed and utilised in the early part of the last century. The new Turbine House was built on the site formerly occupied by a Victorian sawmill and is now powered by water taken from the Cluny Burn. The footings of the old Mill and the Mill lade were exposed during the construction of the Turbine House and a comprehensive archaeological dig was carried out. The owners of Edradynate are true countrymen and the inspiration for such a scheme was born from a desire to continue to maintain and reinvest in the Estate and local economy. Their passion for the local area and desire to preserve the landscape led to close working relationships with Perth and Kinross Council, Scottish National Heritage (SNH) and SEPA with Design and Project Management from Hydroplan and construction work by DA MacDonald (with a team of local sub-contractors). One of the most important considerations made by all parties was the potential impact on the environment during construction and in the long term. Extensive survey work took around 18 months to complete with a strong focus on minimum disruption to wildlife, archaeology, environment and also local residents (who have benefited by significant improvements to their private water supplies). Careful consideration was made in regards to details such as using a British made Gilkes Turbine which is more expensive than European alternatives but has a much longer life expectancy. The construction period was 12 months and came in earlier than programmed and under budget. With an average rainfall for this area of Perthshire of around 46 inches, the scheme can reasonably expect to produce a maximum of 999kWH – or sufficient to power 662 average sized houses. Plans are currently being considered to improve the efficiency of the water use in the hydro scheme which would lead to additional electrical production.